I had never heard of allergies until I was in my mid-twenties so, as far as I am concerned, I had never suffered from any but once I knew about them they seemed to be everywhere. I had heard of Coeliac disease but I had never associated that as just being one of many allergies, nor understod what it was. And I had certainly never heard of any one being allergic to flour or wheat! Almost certainly allergies seem to be on the increase with more and more people suffering from them. In fact, many allergies can make life unbearable and I suppose the worst type are food allergies because we all have to eat. Everyone who has brought up children knows how fussy they can be when it comes to eating but imagine what it must be like to have a child who is not fussy through choice but cannot eat any of the normal foods because of allergic reaction. 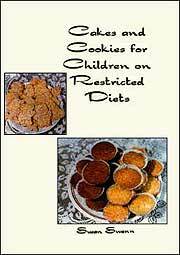 That is what Susan Swann, who has written "Cakes and Cookies for Children on Restricted Diets", had to cope with for her youngest child Gemma. "It soon became apparent that Gemma had Multiple Food Allergies and Food Intolerances. By the age of three and a half Gemma was unable to tolerate any food at all and was Naso-Gastrically fed with a chemical substitute for twelve months". Susan tells, in the introduction to her book, how gradually Gemma was brought back on to solids. However the part of Gemma's diet she found it very difficult to find substitutes for was cakes, biscuits and bread. Through experimentation a series of recipes were created with the focus being on Gemma's allergies and food intolerances, but at the same time creating recipes which her four older children would enjoy eating so that Gemma did not continually have different foods from the others. If you are a parent with a child suffering from food allergies or food intolerance then this book is worth its weight in gold to you. Following a brief introduction Susan guides you through the various foods that cause allergic reactions or food intolerance. For example, did you know that "Wheat flower is added to White Pepper . . ."? Or that "Corn is sometimes used as a glue on envelopes and stamps"? The main section of the book is of course the recipes. 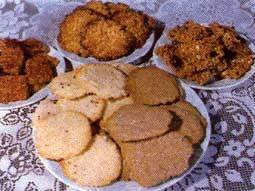 There are one hundred and one of them for cakes, biscuits, flapjacks and cookies. Although written with children in mind adults can enjoy all the recipes as well. Each recipe is clearly laid out with a list of ingredients, cooking temperatures in centigrade and Fahrenheit as well as the relevant Gas mark, clear instructions and, most importantly, which diet the recipe is intended for. To further help you, at the back of the book, there are conversion charts, a glossary of alternative ingredients that are used and a chart of all the recipes showing which food allergies or intolerances they are suitable for. What are you waiting for? Order your copy from Susan and get baking! This recipe is dairy free, gluten free, wheat free, corn free, egg free and yeast free. Pre-heat the oven to 190°C / 375°F / Gas 5. Prepare an 18 cm (7") sponge cake tin. Mix the bicarbonate of soda, soya milk and golden syrup together in a litre jug. Leave it to one side for now. Beat the margarine and sugar together in a large mixing bowl until creamy and paler in colour. Pour the liquid mixture in the jug into the creamed margarine and sugar. Beat well together. It will curdle. Add the flours beat well. 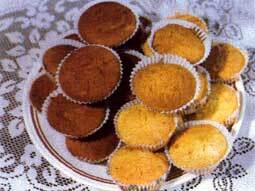 Put the mixture in the cake tin and even out or divide it into 12 paper cases in a bun tin. Bake in the centre of the oven for about 25 minutes, 10 - 15 for small cakes. To test if the cake is cooked gently touch the top of the cake with your finger if it is cooked it will spring back when you remove your finger. Leave to cool for 10 minutes and then place the cake onto a cooling rack to cool completely. Cut the cake in half and sandwich it together using jam or butter icing (using a dairy free margarine). Decorate the top by dusting it with icing sugar.